[Matthias Hullin], the creator of the snega2usb let us know that its name has been changed to the Retrode. 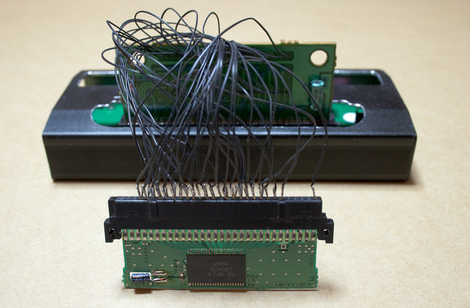 We watched this device go through the development cycle and learn to read SNES and Sega Genesis cartridges via a USB connection. Now it’s seeing some hacking to extend those capabilities. [Jon] managed to rig the Retrode up to read Virtual Boy cartridges. The Virtual Boy was a Nintendo console from the mid ’90s that used two different screens in a glasses format to produce a 3D gaming experience. Now that the cartridges can be easily dumped you have a chance to replay the titles using an emulator. How could you play Virtual Boy games without 3D? @Laminar: The emulator… emulates two screens, and you can optionally use red/blue tinted glass to get by. I imagine it’s fairly flexible, such as forgoing 3d all together. –It’s a moot point though, there’s only ~30 games [certainly <100 I think]. Does this adaptation also pull the cart title to present the correct name for the file-emulation? While this is really cool, the virtual boy library has already been dumped. There is also an out of production flash cart so you can play the dumps on the original hardware. I really wish I owned one. And believe it or not, there is a very quiet homebrew community for the Virtual boy. just for the record, the virtual boy actually used a single row of LEDs and a rotating mirror, like a POV setup. Not two screens. @PidGin128 The new firmware for the Retrode will have support for Virtual Boy carts, it gets the game name from the ROM header to make the file name. I picked up a used VB on eBay not too long ago, mostly for the nostalgia factor. It’s great! And there is definitely a surviving homebrew community at http://www.planetvb.com. Also, once you adjust the unit properly for your eyes, there are no headaches! I’ve played for hours and never gotten a headache. The neck issue is still there, however. To set the record *straight* the VB has *two* rows of LEDs and *two* vibrating (not rotating) mirrors, so it does, indeed, have *two* displays. Of course, they’re called scanners, not screens, since there isn’t a large surface covered with pixels like a traditional display device. Right, and how do you legally obtain these dumps? Only by making your own. My thought is that as long as you own the physical carts, why wouldn’t it be kosher to download someone else’ dump? Makes no difference whether you personally put in the work or not. I own the carts for every one of the emulated NES/SNES/GB games I play. Yea, everything’s dumped, of course… Only thing is that the only real VB emulator hasn’t been updated in years and the best of the few games are unplayable- Project needs some folks to pick it up. The VB game Red Alarm is this really, really great throw-back to “ray trace” type arcade games from the late 70’s. It’s like Star Wars arcade, but the line polygons are stereoscopic and it’s a freely explorable environment! People complaining about aches and pains from the display are… “overly sensitive”. haha Never had a problem with it. It has always been popular to mock this system- I suspect most kids who claimed it was awful had never even touched one. I still miss the controllers- I wouldn’t mind trying a usb interface for one of those. Cheers for the enjoyable read, it was actually just what I was after. I look forward to seeing more of your blog.